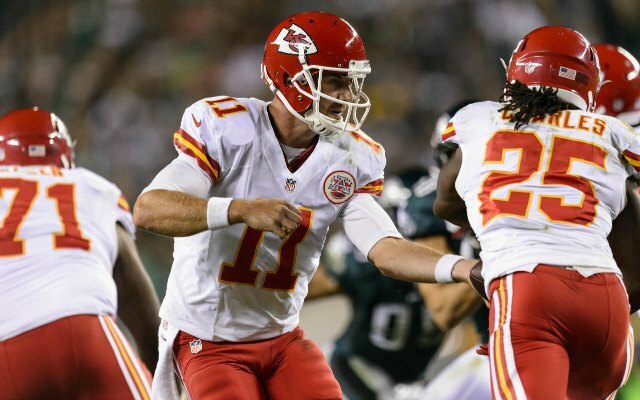 Alex Smith: Week 3, at Philadelphia. After charting Alex Smith’s first two games as a Chief, I noted after the Cowboys game that if there was ever going to be a time in which the cautious Smith was going to open things up down the field, it would be this week against a terrible Eagles secondary. Well, by his standards Smith did open things up Thursday Night – he threw two passes that went at least fifteen yards down the field instead of one or zero. One was a Hail Mary at the end of the first half. The other was his best throw of the season so far, a 15-yard completion to Donnie Avery in between two Eagles defenders to spark a long, clock-munching drive in the middle of the fourth quarter that led to a field goal and basically ended any real hope for an Eagles comeback. Right now, analysts are praising Smith’s game management and ability to avoid turnovers thus far this season but part of Smith’s “success” in that area is just plain old luck – he’s had three dropped interceptions the last two games alone. And while pulling the ball down and scrambling for two yards any time you feel the slightest bit of pressure or don’t like what you’re seeing downfield in the first three seconds of a play may be a good way to avoid unnecessary turnovers, it’s also a good way to get stagnated offensively and resign yourself to 15-20 points a game. Kansas City has a good defense and an easy schedule, so having a quarterback that plays that conservatively may very well be a good ticket to the playoffs. To make any actual noise there, though, Smith is going to have to make more contested throws than he’s even attempted so far in 2013. Michael Vick: Week 3, vs. Kansas City. Both of Vick’s interceptions Thursday Night were the result of staring down his receivers and throwing late to them – Derrick Johnson tipped the first interception into the arms of Eric Berry for a pick-six and Sean Smith jumped in front of Riley Cooper on the second. It was a really rough night for Vick and the Eagles passing game in general, who caused their fair share of self-inflicted wounds but also seemed overmatched by the Chiefs defense. Justin Houston and Tamba Hali wreaked havoc from the edge on the pass rush and the Chiefs linebackers and secondary held DeSean Jackson and LeSean McCoy – far and away, the two best Eagles receivers – to just eight targets, three catches and 62 yards (McCoy was only targeted once). The Eagles hit a lot of big plays in the running game, wracking up 260 yards on just 28 attempts. But when they needed to pass the ball Thursday Night, they usually got bushwhacked. That passing game figures to be the main key to how good or (potentially) great the Eagles offense will become this season. So far, they’ve run the ball with great success in all three games but have had red flags arise from their attack in two out of the three. Against Washington, Vick’s inaccuracy kept the Eagles from fully embarassing a completely overmatched Redskins defense. And Thursday Night against Kansas City, strong opposing game-planning and sloppy play rendered a great rushing night from Vick and McCoy moot. The Chiefs appear to have one of the better defenses in the league and we always have to keep the short week of preparation caveat in mind whenever a team plays sloppy in a Thursday Night game. The Eagles will likely remain one of the most exciting teams to watch in the league all season and there’s a 100% chance next week’s game at Denver will be the most exciting game of the week. Going forward, though, production out of the passing game from Vick and his receivers will determine whether the Eagles are exciting and dangerous late in the season or just exciting and ultimately inconsequential. This Post was posted in 2013 NFL Regular Season, Analysis, Game Recaps, Quarterback Charting, Stats and tagged Alex Smith, Football, Kansas City Chiefs, Michael Vick, NFL, Philadelphia Eagles, Sports. Bookmark the permalink.